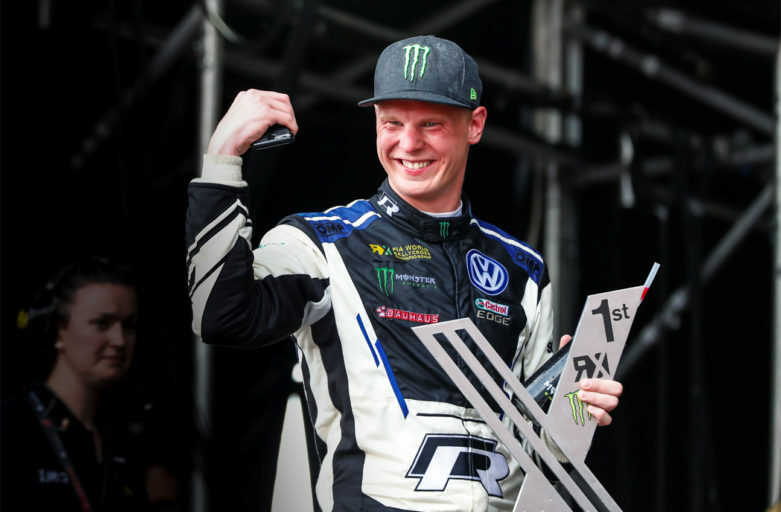 Ruling world champion Johan Kristoffersson was in a class of his own when he took the victory at the first World RX ever at classic Silverstone in the UK. This was Johan’s third win in four rounds this season, which means that he is extending his championship lead. The weekend began in the same way as it has previously this season, with a tough Saturday for Johan. The Swedish driver set a fourth and a sixth quickest time in Q1 and Q2. ”I don’t know what it is with me and Saturdays. Seems like I’ve become more of a Sunday person. But that’s ok since the final is on Sunday” said Johan. On the day of the final, the championship leader had found the speed in his Volkswagen Polo R Supercar. 50 points in both Q3 and Q4 meant 16 qualifying points and pole position in the first semi-final. That’s when things got a bit more dramatic. An incident with team-mate Petter Solberg in the first corner made Johan crash into a pile of tyres and the race got a red flag. ”Already ahead of the semis I had a problem with the radio. I couldn’t hear the spotter. We managed to solve the issue, but it became a little stressful. And then when we reached the first corner, Petter and I hit each other and I crashed right into the barrier. That was absolutely not our plan” said Johan. When they re-started, everything worked out according to plan for Johan. He got through the first corner without problems and could then in a controlled way secure the win in the semi-final and score another six points. In the final, Johan’s Polo R Supercar was the quickest one in the start and after a great drive with a flawless joker lap, the ruling world champion took home his third victory in four events this season. The weekend also gave him maximum points, 30, to add to his collection. After the dramatic semi-final and the following final, it was obviously a big relief that Johan finished on top of the podium. ”As you probably can guess, I’m so happy right now. We had a super stressful hour, but we took the victory and scored important points for PSRX Volkswagen Sweden, which is the main thing” said Johan, stating that this was maybe the toughest of all his thirteen World RX victories. With this result, Johan extends his overall championship lead and has now 105 points – 14 points ahead of Sebastien Loeb with Andreas Bakkerud in third, 22 points behind.